To use for selection of surgical procedure and objective evaluation of postoperative results. Classified based on intraoperative assessment of the location site and size of the hernia orifice. Must be simple and useful for general surgeons. Applicable to both anterior and laparoscopic approaches. Other details should be described separately as additional notes. The diameter of the hernia orifice in direct (medial) hernia (supravesical type, localized type). The size of the hernia sac: stays within the inguinal canal, protrudes from the inguinal canal, or reaches the scrotum. In recurrent hernia, “Rec” should be added and the previous surgical procedure(s) should be described as much as possible. The diameter of the orifice defines less than 1cm (1 fingerbreadth); provided that less than 1 fingerbreadth defines that the fifth finger cannot be inserted into. The diameter of the orifice defines equal or larger than 1cm (1 fingerbreadth) and less than 3cm (2 fingerbreadths); provided that less than 2 fingerbreadths define that the second and third finger cannot be inserted into. The diameter of the internal ring defines equal or larger than 3cm (2 fingerbreadths). The diameter of the orifice defines less than 3cm (2 fingerbreadths), and the center of the orifice is within the medial half of the posterior wall of the inguinal canal. The diameter of the orifice defines less than 3cm (2 fingerbreadths), and the center of the orifice is within the lateral half of the posterior wall of the inguinal canal. The diameter of the orifice defines equal or larger than 3cm (2 fingerbreadths). Recurrent hernia is described according to the classification of the primary hernia. In principle, the size of the hernia orifice should be measured at the level of the transverse fascia after the dissection of the pre-peritoneal space. 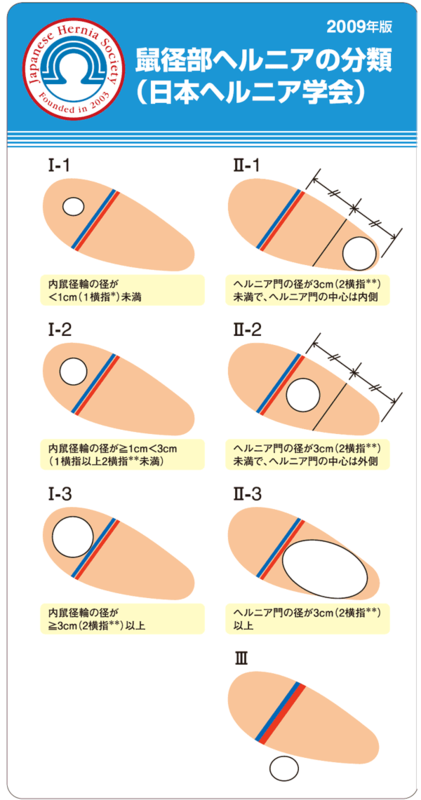 In laparoscopic approach, the maximum diameter should be measured. There is no matter the positional relationship with the umbilical ligament. The posterior wall of the inguinal canal defines from the outer edge of the rectus abdominal muscle (sheath) to the inner edge of the hypogastric vessels, and the Henle’s ligament or the inguinal falx also includes in case those exist outside the outer edge of the rectus abdominis muscle (sheath).